Join one of our adult circus classes to challenge yourself with aerial silks, get competitive with combat juggling or break a sweat with a strength class! At Circus Akimbo we work to your individual strengths, and with achievable progressions and small classes, you’ll be amazed at what you can achieve! All ages and levels are welcome, just pick the best class for you below. You can find out more about clicking on each session, but if you have any questions, please get in touch so we can help you find your perfect class. Book into an upcoming class to experience the magic for yourself! We know life is busy, so we like to keep things simple at Circus Akimbo. 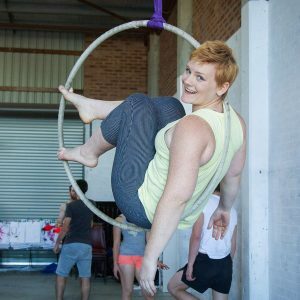 All our adult circus classes are casual, so you can pick and choose the sessions you want to attend each week and reserve your place online. Simply purchase the class pass of your choice and then click “Sign Up” from your account to enrol in a class. If you’d like more information, have a read through our Class FAQ, read through the class descriptions or get in touch if you have any further questions!